This download provides drivers for the Intel Integrated Graphics in Intel Processors like Core i3, i5 and Core i7. Supported processor architectures are: Sandy Bridge, Ivy Bridge, Haswell, Broadwell, Skylake, Kaby Lake and Coffee Lake. IGCC scans for installed games to provide 1-click optimization of in-game settings based on the user's hardware, and the ability to create custom game profiles to directly tune individual game settings. Join the Industrial Revolution of the 19th century and start building your industry empire with Anno 1800, help save humanity from a zombie invasion in World War Z or use your hearing sense to investigate crimes in Unheard on Intel UHD Graphics 620 or better. This driver is WDDM 2.6 compliant. Support for DirectX 12 Shader Model 6.4 compiler. Support for PSO cache for Compute Shaders. Various performance improvements for D3D12 MetaCommands in DirectML. Power savings improvements for integrated panels. NOTE: This driver contains stability and security improvements. Intermittent crashes or hangs may occur in Devil May Cry 5 (DX11). Minor graphics anomalies may be observed in Re-Legion, Arma 3 (6th generation processors only) and Dreamfall the Longest Journey. Rise of the Tomb Raider might display an error message when running DX12. Minor graphics anomalies may be observed in Apex Legends (low quality settings with TSAA disabled on 6th generation Processors only), Devil May Cry 5 (DX12), Generation Zero, and Tom Clancy's The Division 2 (DX12). Intermittent crashes or hangs may be seen in Anno 1800 (DX12) and World War Z (Vulkan). Corruptions may be seen in video recorded by Cyberlink screen recorder. This is the recommended driver for the early access release of the brand-new Intel Graphics Command Center. 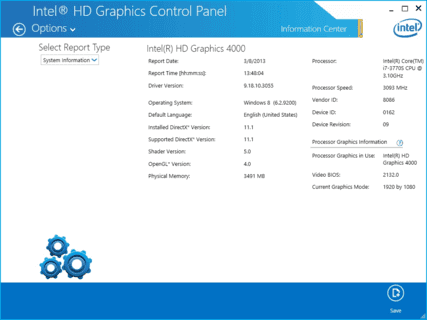 If not already installed, this driver will add the Intel Graphics Command Center to the system. Experience a game of cat and mouse set in a vast open world in Generation Zero or set sail in One Piece: World Seeker on Intel UHD Graphics 630 or better. Take control of the first modern human settlement and guide through their survival in Dawn of Man on Intel UHD Graphics 620 or better. Adds Intel Extension to support wave intrinsics on DirectX 11. HLSL Header file is now available on GitHub. Performance optimizations for My time at Portia. Windows 10 HDR support improvements. Reduction in CPU overhead when running media/video workloads. NOTE: This driver contains stability improvements. Intermittent crashes or hangs may occur in Resident Evil 2 / Biohazard RE:2 (DX12), Devil May Cry 5 (DX12). Minor graphics anomalies may be observed in Battlefield V (DX11). Color and contrast may shift while playing Youtube and moving the cursor. Minor graphics anomalies may be observed in Apex Legends (low quality settings with TSAA disabled on 6th Generation Processors only), Re-Legion, Arma 3 (6th generation processors only), Generation Zero, and Tom Clancy's The Division 2 (DX12). Color band may be observed on either side of Netflix playback on HDR displays. Performance improvements and optimizations for Arma 3 on 6th Generation Intel Core processors or higher. Power and performance benefits for DX12 games and applications using placed resources. Minor graphics anomalies may be observed in Final Fantasy XV and Microsoft Edge browser. OpenGL stability fixes for background applications. Few Internal panels may show black screen after installing graphics driver. Content protection may not enable when resuming from sleep after connecting display port monitor. Rotation may not be persistent when swapping displays in multi-monitor configurations. Garbage may be seen while using Multi Stream Transport (MST) monitors. Minor graphics anomalies may be observed in Battlefield V (DX11), Apex Legends (6th Generation Processors only), Arma 3 (6th Generation Processors only), Re-Legion and other games. Intermittent crashes or hangs may occur in Crackdown 3, and other games. Color band may be observed on either side of Netflix* playback on HDR displays. Support for fused operations to improve performance. Support for Pooling Metacommand - this operation now uses metacommands for both FP32 and FP16 datatypes and is common in many topologies like Squeezenet, Resnet, Inception etc. Enables Indigo benchmark application to run. Adds compiler API for DX11 and DX12 shaders to allow compiling shaders offline to analyze the ISA (native code) generated. This can run independently of the runtime driver and is expected to understand shader performance. Improved shader cache performance of DirectML metacommands for Microsoft WinML- based applications on 7th Generation Intel Core processor and higher. Performance improvements and optimizations for F1 2018 (DX 12) on 6th Generation Intel Core processors or higher. Enhanced support for Windows 10 Ambient light sensor framework. Intermittent crashes or hangs may occur in Battlefield V (DX12). Minor graphics anomalies may be observed in Farming Simulator 2019. Video profile settings in Intel Graphics Control Panel may not apply after white balance or color balance. Intermittent crashes or hangs may occur in Cinema4D application, and some games. Minor graphics anomalies may be observed in Battlefield V (DX11), and other games. Game Performance Improvements and optimizations for Warhammer Vermintide 2 on 6th Generation Intel Core processors or higher. Display Pattern and +/- buttons may not show up sometimes in Intel Graphics Control Panel when enabling Bezel Correction in Collage mode. While using two displays, the arrangement settings in Windows may reset if the resolution of the second display is changed. In addition, this driver is also ready for BlazBlue Cross Tag Battle, Lust for Darkness, and The Awesome Adventures of Captain Spirit. In addition, this driver is also ready for The Forest and Ancestors Legacy with Intel Iris Pro Graphics or better. This new driver brings significant quality and power saving improvements while displaying Enhanced Dynamic Range (EDR) content and provides better brightness in High Dynamic Range (HDR) mode for 7th Generation processors or higher. Intermittent crashes or hangs may occur in Tom Clancy's The Division (DX12) and other games. Display format optimizations on 7th Gen Core processors or higher. Intel is introducing a new feature with the ability to automatically configure game settings for Intel Graphics on 6th Gen Processors or higher (including systems with 8th Gen Core Processors with Radeon RX Vega M Graphics). Look for the 'Gaming icon' in the Graphics Control Panel. This feature is still in beta so game availability and functionality is limited. Stay tuned for future improvements and more games coming soon! Check out the updated graphics control panel! It now showcases the latest optimized games for Intel Graphics. Calling all Jedi masters and Sith lords! Star Wars Battlefront II and many other games such as Mass Effect Andromeda, Battlefield 1, Rise of the Tomb Raider, F1 2016 get improved load times, performance optimizations, and enhanced playability using DirectX11. Enjoy an extreme off-road gaming experience with Spintires: Mudrunner, create the ultimate soccer club in Football Manager 2018, play your cards in Hand of Fate 2, and immerse yourself in the World of Final Fantasy on processors with Intel HD Graphics 620 or better. Battle for control over the magical vortex while enjoying performance optimizations and playability improvements in Total War: WARHAMMER II. Put the pedal to the metal while playing Need for Speed: Payback, enter the Lego universe in Lego Marvel Super Heroes 2, and enjoy playing Black Mirror and SEVEN: The Days Long Gone on Intel Iris Pro Graphics. Improvements in the Intel Media SDK (MSDK), leading to better encoding quality across dependent media apps such as PowerDirector, MAGIX, etc. This driver enables the Microsoft Windows 10 Fall Creators Update, thereby providing support for users to experience HDR playback & streaming on systems with Intel UHD Graphics 620 and Intel HD Graphics 620 or better, enjoyed on HDR capable external monitors and TVs. Escape the everyday to a world even beyond your imagination! With Windows Mixed Reality, you can explore new worlds, travel to top destinations, play exciting games, lose yourself in the best movies and entertainment and more. This new WDDM 2.3 driver also provides security fixes, support for Wide Color Gamut, enables 10-bit HDR playback over HDMI, and enables video processing and video decode acceleration in DirectX* 12. Experience the magic of The LEGO Ninjago Movie Video Game on processors with Intel HD Graphics 620 or better. Battle singing Orcs and score legendary goals while enjoying performance optimizations and playability improvements in the newly released Middle-earth: Shadow of War* and Pro Evolution Soccer 2018 on Intel Iris Pro Graphics. Take on The Cabal* and keep the enemy in your sights in these newly released, fast action-packed sequels to legendary favorites, Destiny 2*, Call of Duty: WWII, and Divinity: Original Sin 2* on Intel Iris Pro Graphics. This driver is the first to support the newly launched 8th Gen Intel Core Desktop Processor Family. Drift down the finish line or conquer the arena as you enjoy performance optimizations and playability improvements at release of the anticipated games, DiRT 4 and Tekken 7 on processors with Intel HD Graphics 620 or better. Other Intel products may benefit from these optimizations as well. Visit gameplay.intel.com for recommended game settings for many of your favorite PC games. Get back in the battle quicker with significantly reduced load-times in many popular titles, including Star Wars Battlefront, Mass Effect: Andromeda, Rise of the Tomb Raider, Battlefield 1, and other games. Keep the enemy in your sights with performance improvements and smoother gameplay on the games, World of Warcraft: Legion, Tom Clancy's The Division, and For Honor. This driver enables third-party display EDID overrides, therefore enabling custom resolution support for internal and external panels. This driver provides essential security updates, while also providing performance optimizations on popular gaming titles: For Honor™, Halo Wars 2*, Sniper Elite 4*, and Tom Clancy's Rainbow® Six Siege. This driver also provides essential fixes to prevent some crashes in Battlefield™ 1.